The 2017 model of Mazda’s popular MX5 Miata is now available in Canada. Read our blog post to find out the difference between models, prices and colours. The luxurious lines of the 2017 Mazda MX5 led some to believe that it might be prohibitively expensive due to its stunning new looks. However, Miata fans were pleasantly surprised when the pricing data was released. Starting with a very reasonable MSRP of $31,900, this vehicle is very competitively priced to keep its loyal admirers happy. After all, Mazda recognizes that a big part of this amazing automobile’s allure is the ability of the manufacturer to keep the cost at an acceptable level. This is a seriously sporty vehicle that is being offered at an extraordinarily attractive price, and drivers have been expressing their jubilation whenever they swing by a dealership to test drive it. Although the materials and parts are all top-notch, the cost is something that Mazda lovers are able to bear. 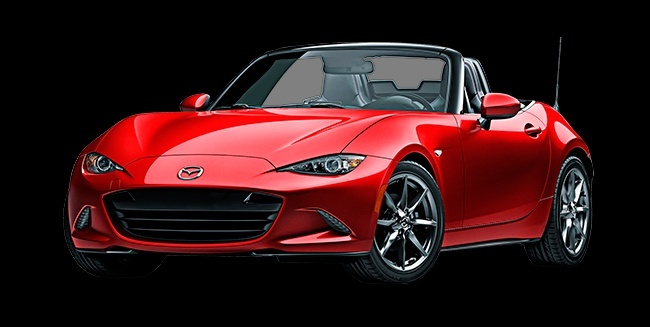 Obviously, the final price of a vehicle depends heavily upon the trim level and accessories, but the starting cost allows for all kinds of consumers to consider the Mazda Miata 2017. For this year, the colours being offered are more understated yet somehow eye-catching than ever. Available in Crystal White Pearl, Jet Black Mica, Meteor Grey Mica and Ceramic Metallic, the 2017 Miata boasts colour possibilities that will make drivers feel ready for a day out on the racetrack—or an evening out at a fine restaurant. With black on black on the interior, minimalists may luxuriate in the sense of a streamlined theme. Indeed, no detail was spared when designers were dreaming up the colours for the 2017 Mazda Miata. Constantly reminding drivers how luxurious it feels to own a convertible, this magnificent model boasts a soft top complete with a glass window in the back. Features such as the push button start and 16″ silver finish alloy wheels make customers take a second look. This model possesses a lot of the creature comforts that contribute to a smooth and enjoyable ride. This car bursts onto the scene with all of the spirit and energy Miata drivers expect. With its SKYACTIV-G 2.0-liter DOHC 16-valve 4-cylinder engine, this year’s Mazda Miata reflects all of the innovative engineering work that has been done in order to make this engine as efficient and powerful as possible. The 17″ gunmetal alloy wheels provide the finishing touch that a car of this caliber deserves; in other words, it’s a real head-turner. This is the supremely souped-up version of the Miata. With the high-lustre wheels and pretty much all of the bells and whistles that let others know that this is what it’s like to drive a premium vehicle—for the price of an affordable one. The convertible cloth top liner and Bose® system truly take this model into a new standard of excellence. This system puts an exclamation point on what is already quite an exceptional vehicle. This is the model that most of the buzz has been about recently. Much of the news media has been comparing the 2017 Mazda MX5 Retractable Fastback to a certain European sports car that possesses a much higher price tag. The power-folding top only takes about 12 seconds to get the job done. Drivers are swooning over the lines of the fastback when the top is closed. Part of the fun has been the surprise factor. No one really expected Mazda to come out with a fastback, especially not one as sleek and refined as this one. Eager Mazda fans have been lining up at dealerships to see this convertible up close. This convertible certainly doesn’t disappoint. It has all of the spirit of the Miata. With a futuristic, super premium bent, drivers will be excited about the RF for years to come. The Miata has come a long, long way since its debut at the Chicago Auto Show back in 1989. This retractable fastback is proof that the model will continue to evolve in unexpected yet innovative ways. Build & price your Miata, or better yet, book a test drive today!